All photographs were taken in 2003. However, again, in 1999 they moved to a hermitage-like-house in Pentrefelin in Lleyn Peninsula. 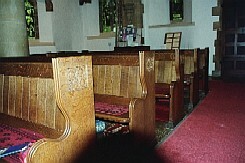 They went to St. John's Church in Porthmadog to attend the services there and used to sit together on the fourth seat from the backmost row of the seats. R.S. was the only one who spoke Welsh fluently in his family so he spoke in Welsh with the vicar, a native Welsh speaker. R.S. received the Cymrodorion Medal at his house in July, 2000. However R.S was sent to the hospital at Pentrefelin in September 2000 because his heart trouble got worse. After two weeks in the hospital he passed away at the age of 87. 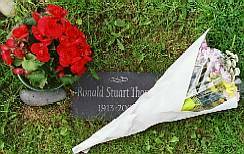 His ashes are buried near the porch of St. John's Church in Porthmadog, where a communion service of thanksgiving for his life was held on Sunday 3rd December 2000. There is also his plaque on the ground beside the church's main entrance. In 2002: I had an interesting encounter at Cricceith. 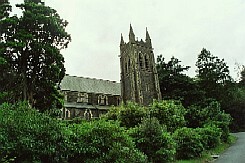 I have never been to St. John's Chuch in Porthmadog, though, I have a quite interesting memory at Cricceith. After having visited Aberdaron in August, 2002, I stayed at Cricceith for one night. At the night, I met an old man drinking at a pub. While I was waiting for my beer at the counter, he smiled and spoke to me. He asked, "Do you speak English?" I replied, "Yes." But he asked me the same thing again and again. I wondered if my English was so bad. He suddenly said, "You are the same with me." I muttered in my heart, "What? What is the same? Does this man drink too much...?" He sipped and said, "You have an another language? And you speak in English. It's the same with me. 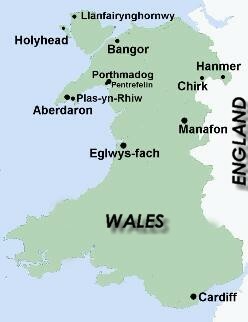 My language is Welsh." It might take a few years for me to get to St. John's Church. 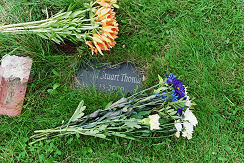 I have some other places concerning R.S.Thomas to visit and some places to visit again. I am on the way of the pilgrimage. This church would be its goal. In 2003: I visited the THE CHURCH. It was the luckiest day for me during my travel from Ireland to England via Wales in 2003. It was on the way from Aberdaron to Llanfair Caeienion that I found St. John's Church. Its building was surrounded by the tall trees and stood gravely on an upland along the main road. I parked my car near the hill and went up the slope to the church on foot. Nobody was there when I reached there. It was very easy for me to find on the chuchyard R.S. 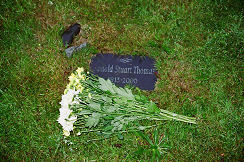 's plaque -- a small slate beside small white flowers in a flowerpot. Did he leave only this? Many of the books he had possessed were sold when he died and some of them with his chair survived at R.S. Thomas Study Centre in the University of Wales, Bangor. And was it only this slate that he left 'At the End'? -- "Few possesions; a chair, / a table, a bed/ to say my prayers by"
Yes, he did leave too much poetry for us. Although they have plain lines on their surfaces, they remains mysterious and inscrutable in the deep. He left not only "Few possesions" but so many poems of prayers to search for God in this modern world, I thought when I took a picture of his plaque. As I lifted my head from the ground, I noticed a man stood a little bit away from me. He smiled and said, "R.S. Thomas!" He was the vicar of this church and welcomed this strange Japanese man very warmly. He invited me to the inside of the church and had a conversation with me for more than 30 minutes. I will never forget this warm welcome and chatting with him, that was very significant and even impressive. Yes, it is always on the upland that a man gets the important message -- like R.S. on the Manafon hill or Moses on the Mount Sinai. 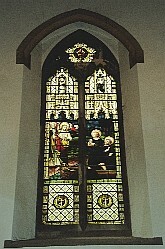 2004:I just dropped in on the church with a bunch of flowers on the way to Mynydd Mawr on Sunday morning. 2006 was a very busy year for me. I gave three presentations, two of which were on RST's poetry, at each other conferences between May and July as well as I taught at some universities. In August I gave lessons as a correspondence course at a university. After finishing it, I flew to U.K. for three weeks for my vacation! It was a foggy evening when I got to the church. As two of my presentatons on RST's poetry had successfully finished, I thanked for it to RST's plaque. Pentrefelin lies between Cricceith, a family resort town facing Cardigan Bay, and Porthmadog, a busy town named after William Alexander Madocks. Both Cricceith and Porthmadog have the train stations. It takes about 5-6 hours from London by the direct train.